Disney News and Interviews From The Mouse Castle: Inside The Mouse Castle 08-26-2014 - The Emmys' Robin Williams Tribute, Villains at Walt Disney World and Happy Anniversary 'Mary Poppins'! Inside The Mouse Castle 08-26-2014 - The Emmys' Robin Williams Tribute, Villains at Walt Disney World and Happy Anniversary 'Mary Poppins'! This year's Emmy Awards show was a generally entertaining, if unsurprising, TV spectacle (Breaking Bad...check. Modern Family...check). If there was one reason to tune in Monday night, however, it was to catch Billy Crystal's poignant tribute to his close friend Robin Williams, who died on August 11. In the latest Inside The Mouse Castle, Anthony and I discuss one of the most moving In Memorium segments of this, or any other awards show, in recent memory. Walt Disney World's Magic Kingdom is adding an extra touch of villainy to Mickey's Not-So-Scary Halloween-Party this year. The Villains’ Sinister Soiree: A Wicked Takeover of Cinderella Castle is a new event, hosted by the evil stepmother herself, Lady Tremaine, that features music, desserts and special viewings of Mickey’s “Boo-too-You” Halloween Parade and the Happy HalloWishes Fireworks Spectacular. It sounds like fun, but is it really worth the $99 price tag to get in? 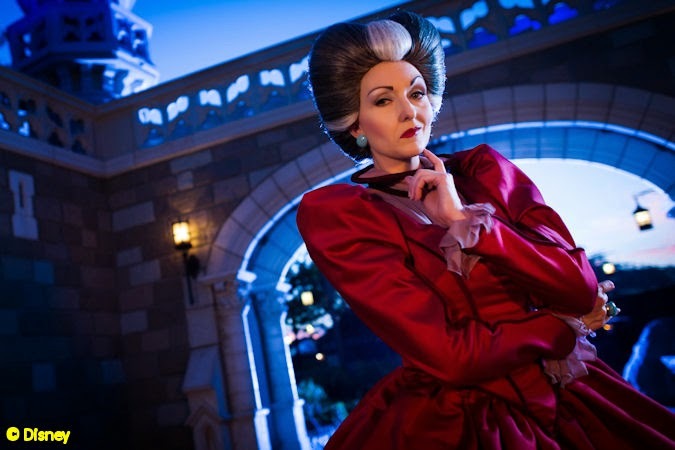 Lady Tremaine hosts the Villains' Sinister Soiree at the Magic Kingdom. Happy 50th Birthday to the practically perfect Mary Poppins, which opened at Grauman's Chinese Theatre in Hollywood on August 27, 1964. Community star Donald Glover will finally get a crack at playing a role he's long coveted, Spider-Man. Previously passed over for current film Spidey Andrew Garfield, Glover will voice the web-slinger in Disney XD’s animated series, Ultimate Spider-Man: Web Warriors. We're really excited about a new book written by longtime Disney animator Andreas Deja. The Nine Old Men: Lessons, Techniques, and Inspiration from Disney's Greatest Animators will be released in February 2015 and you can pre-order your copy on Amazon right now. Starting tomorrow, I will be in the Happiest Place on Earth to take part in the Disneyland Half Marathon Weekend. I'll be running in the 5K race on Friday and the 10K on Saturday (nope, not doing the half yet). Want to track my progress in the 10K on your smartphone? Text my bib number (30834) to 345678. Interested in other stalkerish behavior this weekend? : Visit http://www.rundisney.com/blog/articles/ATT-Athlete-Alerts-08-25-14.